Dual Purpose Secondaries - AA? I see on many secondary turrets that they are listed as dual-purpose when reviewing the Short/Mid/Long Range AA abilities of a ship. But in all my time using ships that have secondaries even ships without manual secondaries, I have yet to see those secondary turrets activate to fire at air craft. Like the turrets do not animate like they do when firing at ships. Is Secondary AA just a con? If you turn off "animate small objects" in settings none of your AA guns will ever turn to fire at aircraft. If they are DP, yes. If they are not, no. 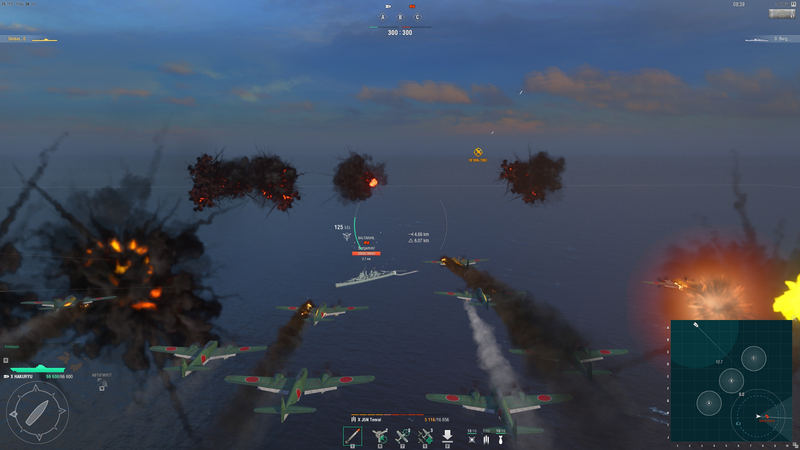 Even some main guns perform AA duties in WoWs. You'll never see them firing at planes, yet they still add to your air defense. Never noticed planes get shot down at 5km? So if I turn animations on, I will see DP Secondaries activate on planes? Afaik no, DP guns will never turn to fire at aircraft. Unless you take the Manual Secondaries skill secondary guns are automatically activated as soon as a target is spotted, in range and within their angle of fire. They do damage, but you will never see them shoot at planes, even with ''Animate small objects'' on. If you turn this on, the smaller caliber AA (Mid and close) will move and track planes. Also, radar sets and such will be animated. Then how did the planes get shot down when there is no other AA with that range? They really should have physical turrets turning toward air threats to be able to contribute to AA value's....some day. And not to contribute to those value's if the player aims/uses them for shooting at other ships ofcourse. Having these main guns "magically" contribute to AA while at the same time in use to fire on surfacre targets is unrealstic for certain and a bit rediculous in game. Unrealistic, certainly, but necessary for gameplay purposes nonetheless. They could just buff the damage of dedicated AA guns to desired value's and add the damage of dual purpose ones when and if the player does not use them and has to pay for that in turret rotating ( back ) time when he wants to aim at surface targets. Ofcourse there really should be a button blocking dual purpose main guns turning automaticly for AA if you don't want to. P button proves that is not such a wild idea. I think it is a server data/load thing.....this mechanic is much more simplistic, just as the " AA aura's" of old were and still more or less are. This dissapointed me when i found out....i like animation a lot. do you think a 40mm bofors can make an air burst that large??? Considering you're currently within mid range AA (aka 40mm range), yes. Overlapping AA auras is a thing of the past. Starting at 3,5km the DP guns of a Baltimore stop firing. Flak bursts are created by long and mid range AA. It doesn't matter whether these guns were capable of creating them irl. They should have a mechanic where Dual-Purpose Secondaries physically switch between surface and air targets depending on priority. So if a ship does not have Manual Secondaries skill, then the DP Turrets should set priority of Air > Surface Targets and turn to engage them as they come into range. Actually seeing Secondary Turrets turn to engage planes would add another level of realism to the interactive gameplay environment. If a ship does have the Manual Secondaries skill, then it should only prioritise surface targets when a target is actively selected else set priority to Air > Surface targets as they come into range. To see the turrets animate against incoming air threats would be a really nice thing. For ships that use secondary turrets as their main battery like DDs for e.g. I think if they are not engaging an enemy their turrets should be animated when firing against aircraft. DP Turrets should not be able to fire at surface ships and aircraft at the same time. Again, good for realism, but bad for gameplay/meta. An overcomplicated game mechanic that serves no practical purpose other than to look nice = bad.